If you're planning a wedding this summer, check out our free eBook on "33 Summer Wedding Ideas", where you'll find great money-saving tips on summer wedding flower ideas, wedding centerpiece ideas and do it yourself wedding crafts to make your big day truly special. With these wedding ideas, your wedding will be truly one-of-a-kind and will look like you spent a fortune! It's hot, and summer is a beautiful season to get married. Save yourself the stress and money this summer and create your own wedding reception decoration ideas with this collection of crafts for a wedding you will never forget. Download the 33 Summer Wedding Ideas eBook now! Yellow Rose Centerpiece (p.21): Wedding reception table decorations can be a fun expression of the bride's color scheme. For a summer wedding, Yellow Rose Centerpieces are a vibrant way to start the bright future of the newlyweds. Napkin Wedding Flower Boutonniers (p. 30): Bring some color into your wedding party with Napkin Wedding Flower Boutonnieres. 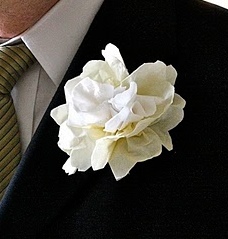 Dana Willard's homemade boutonnieres are cheap wedding favor ideas for the thrifty bride. DIY Pomanders (p.37): Make your own pomander balls for unique wedding ceremony decorations. 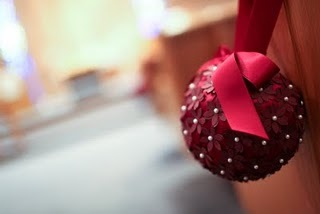 You can hang one pomander from each of the pews for the wedding. Make them in your wedding colors following this tutorial from Chelsey Hill. Charming Heart Straws (p.49): Make these charming heart straws for your wedding or your next party! They're so easy to make with your Cricut machine and some glue dots. These straws make cheap summer wedding ideas, and your guests will love sipping through them! You will get all of these unique wedding ideas and more, from do it yourself wedding flowers to flower girl baskets and ring bearer pillows. Download this eBook for free today and get ahead of the game by creating your own summer wedding ideas! Summer is wedding season, and you'll be the belle of the ball on your special day with these summer wedding ideas! The minute I was notified of this free E-Book I downloaded it. My granddaughter is getting married soon and the "Tulle Flowers" would be perfect corsages. I'm printing the book so I can show it to her so she can make use of all the great ideas. I love the ideas in this book. I do not have a summer wedding but I do have a summer wedding anniversary. I am going to make some of these decorative items to celebrate our special day. The book reminded me that my wedding anniversary day is as special as my wedding day was. Thank you for the lovely ideas.